Add all ingredients to a high-speed blender or food processor, and process until smooth and uniform. Transfer batter to an 8 x 8 Pyrex baking dish or pie plate. Bake at 350 C for 25-30 minutes. You can make the berry topping at this time. 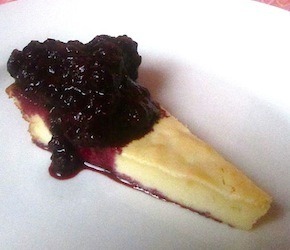 To set into a dense, cheesecake-like dessert, place dish in refrigerator after baking until chilled. Serve with berry topping and prepare for the party in your mouth. Add berries, inulin, and sweetener to a small saucepan and simmer over medium heat, stirring frequently, for about 10 minutes. Allow to cool and thicken or serve hot over chilled cake. Yum!